You are currently browsing the archives for the Motorcycles category. Here’s a quick photo, sent by our production facility. 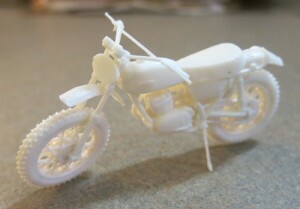 It’s a pre-production sample of the upcoming AMT “Double Dirt Bikes” parts pack. (AMTPP014/24, June release.) 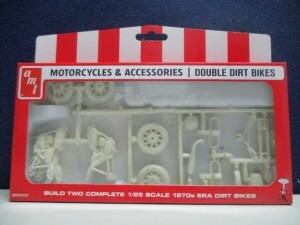 It features a pair of 1/25 scale motorcycles which originated in certain MPC Dodge Pickup and Van kits during the 1970s. While under normal circumstances, I really try to avoid re-branding items, all our parts packs thus far have been done under AMT. So I followed suit on this one. The production parts will be molded in silver, making it easy to build these without the need for a lot of painting, if desired. The die-cut viewing window of the packaging will be slightly different and the custom PVC blister that holds the parts will be black. Overall, final presentation will be greatly improved! The parts build into nice looking replicas for the scale. Now you won’t have to scrounge parts or pilfer vintage kits to enhance your next diorama or custom off-road build project with a sidekick dirt bike!